It seems I should pay more attention to my gut feelings; as mentioned in my previous post and despite my hope that Heidfeld or Fisichella would win this one, my foreboding that it would be Raikkonen proved correct. He drove faultlessly, apart from his use of the run-off area at La Source to stay out of trouble and gain position. The rules are quite clear: gaining an advantage by leaving the track is not allowed and must be penalized (by the same token, Sutil should have been penalized for his pass on Badoer a few laps later). No doubt I will be accused of sour grapes by Ferrari fans but consider where this will end if allowed to continue. There are corners like La Source where it is an advantage to take the longer route through the run-off area since the wider line enables more speed to be maintained and greater momentum for the following straight is gained. If the offense is not to be penalized, drivers will begin to take this option regularly until the leading car realizes what is going on and does it first. Just as the wide option at La Source was invented by Nigel Mansell in a quest for greater speed through this corner, the outside but illegal line will become part of the track for all intents and purposes. Are we then to move the run-off outwards to retain its safety intent? Taking that route can only result in corners becoming wider and wider until they devour the countryside. It is a ridiculous scenario and the stewards should be more aware of the rules and apply them with consistency to prevent this happening. There is no point in having rules that are ignored until the stewards feel the need to be important. I have seen it mentioned that the drivers were told they could use the run-off area in the first lap to avoid accidents but am prepared to bet that nothing was said about gaining an advantage thereby. And, depending on how you view the incident, Raikkonen was either fourth or fifth as he left the track and he rejoined in third. So that was my gripe throughout what turned out to be a pretty good race. Although Fisichella should really have won had the rules been applied (and without the intervention of the safety car), it was wonderful that he claimed second and the first points for Force India. If there is any justice in the world, the car will be just as good at Monza and we will see a first victory for Vijay Mallya's team. It was good to see BMW return to form and the points too. Heidfeld, by his own admission, messed up at the first corner and was unable to get past his team mate thereafter, in spite of being quicker. Even so, his pass on Webber (after the Australian had nearly shoved him into the wall on his release from the pits) was clean and precise. Fourth and fifth places are welcome relief for the team after their disastrous mid-season and they can look forward with hope to Monza, a circuit where they have always been quick. Toyota, however, had a miserable afternoon with Trulli getting into trouble in the first lap and retiring with brake problems later, while Glock lost several places thanks to problems with his fuel rig. Once again my gut feelings turn out to be correct - I said at the time of the Bahrain GP that the team had blown its best chance of a race win this season. Vettel had a great drive to take third place from Kubica at the second stop. The Red Bull was better in Spa than its qualifying form would indicate, as shown by Seb's fastest lap of the race. In contrast, Mark Webber seemed determined to annoy everyone this time and it was only fitting that he should receive a drive-through penalty for his team's unsafe release during the pit stops. Hamilton and Button were out at Les Combes, of course, but Kovalainen made up for the loss of his team leader by coming in sixth. It was a steady drive, threatened by others at times but somehow Heikki kept the McLaren going, unhappy as it was on this circuit. Barrichello, too, made up for Button's demise with a strong drive after nearly stalling on the grid. And Rosberg finished in the points again, no mean effort since the Williams FW31 was not very good at Spa. Finally, Badoer was just that - tail end charlie again. He is talking of doing better at Monza but I doubt very much that he will get the chance. Nor will Fisichella, Mallya and Giancarlo himself having poured cold water on the rumors of a Ferrari call up for the little Roman. And, if you ask me, Fizzy should be glad of that, with the Force India looking so good on fast circuits. Spa was not a great race but I don't think it is capable of putting on a bad one. Some close battles kept us watching, even though few of them resulted in a change of position. And the sight of the cars at speed through some of the most challenging corners in F1 was sufficient to fill in the gaps anyway. What a pity that we have no circuit left to rival Spa's magnificence. "If the offense is not to be penalized...."
This was a racing circumstance, not a planned act and for that reason, deserves no penalty. Being forced wide and not collecting the walls or being stuck in the sand is the intent of the run-off areas. "There is no point in having rules that are ignored until the stewards feel the need to be important." Hmm, the stewards said it is NOT against the rules on lap 1 to avoid contact, which is exactly what happened. In summarizing Clive's sour grapes, BMW got beat by Ferrari and therefore must have cheated. Once again the rules are bent in Ferrari's favour. Not unexpected, then again the teams chose to stick with Mosley and the FIA so they have no one to blame but themselves. The race was entertaining and although it was nice to see Fisichella do well he still doesn't have that magic touch needed to make great passing moves. Perhaps he was ordered not to risk his place or perhaps it was his Holy Roman conscience. It would seem that KERS has created a two tier championship. For some reason the oil dispenser on 007's Aston-Martin comes to mind as another trick to prevent passing. In the end I'm pleased for Raikonen as he's been under a deal of heat lately and now he's proved he can win if given the "A" car although I'm pretty sure he would have had a much more difficult time against a more pugnacious driver. Clive, I've seen the onboard video of Kimi's start, and it is clear that he didn't have thaaaaaaat advantage. The run-off area was just too dirty and bumpy that he had to lift the throttle a bit. Also, the same thing happend at Silverstone with both Ferrari drivers and a Renaut (I think... maybe Alonso) and no one was punished then. If the penalised Kimi, it would be a bit unfair on him and show once again the stewarts lack of criteria. - a driver will be judged to have left the track if no part of the car remains in contact with the track. prejudice to 2(d) below, the driver may rejoin. However, this may only be done when it is safe to do so and without gaining any advantage. The telling phrases are "...for any reason..." and "...without gaining any advantage." It seems to me that the stewards were just reiterating the rule when they told the drivers it was okay to use the run-off area to avoid an accident. Their intent was certainly not to give carte blanche for passing other cars by using the run-off areas. It matters not whether Kimi intended the move or not - its effect was to gain him one or two places. Nick: Strangely enough, I don't see this one as being in the long list of pro-Ferrari decisions made by the stewards; they did not even investigate the incident (and Raikkonen was not the only one to resort to the run-off) and that tells me they did not realize that there was anything controversial in the matter. Remember that Sutil got away with an exactly similar overtaking maneuver a few laps later. As for Fisichella, it was a team decision not to challenge Raikkonen for the lead and so run the risk of losing everything in the event of a collision. One can understand their reluctance, given the evil luck they have had whenever in a points-paying position before. Guilherme: Passing other cars without going faster than them is impossible; regardless of how bumpy the run-off area, logic says that Kimi must have gone faster through the La Source run-off than the cars taking the legitimate route through the hairpin. It stands to reason that a sharp corner cannot be taken as quickly as a more gentle one and those remaining on the track would have had to accelerate from a slower speed than Kimi could maintain through the run-off. Otherwise, there is no way he could emerge in front of cars that were ahead of him at the entrance to the corner. Remember that the important thing is "gaining an advantage". If the Ferraris gained places at Silverstone by using the run-off, they should have been penalized there; if not, then there was no offence to be penalised. As for the stewards, it would be no surprise to me if they penalised something at one race but not at another - that's their usual behaviour, isn't it? The only sour grapes your find here are on Clive`s farm ;-). I really am lost for words when the stewards, at the start of the weekend, start making the rules up. Article blah blah of the International Sporting Code say this, but for this weekend only (subclause one lap only) we will allow you to use as much tarmac and grass as can be walked in 20 minutes. And after last year codswallop I will stop now because my head will explode ;-). I dont know why but I found the race boring (Ham and Button bombing out on the nose cones of rookies might of had something to do with it =-(. But apart from the Fisi/Kimi battle the rest was all `Oil rising above water`after a pit stop sort of racing, found myself switching channels to watch Jonny Herbert`s debut at Silverstone in the BTCC. But I think were all aware of some dark clouds on the horizon, so I think its a case of batten down the hatches for the yearly ridicule from your non F1 friends. Nick: All becomes clear - when outnumbered, it pays to stay alert! Gusto: Grapes for the farm - hmmm, now there's an idea. We don't have them yet! Southernly facing pH 5.5 would go for Delaware`s and Concord`s me self, Oh and a storm on the way from Brazil is expected. Gusto: You know more about grapes than I do! Idle thought, but if I were Fisi, which would I be more tempted by in the twilight of my career? A chance to win in a Ferrari at Monza, or a chance to win in a Force India at Monza? The first driver to use that line at the first corner was actually Hamilton in 2007 when he was forced off the road by Alonso (then his team mate). Hamilton made full use of the run off to come back on track alongside Alonso, before eventually conceding the place a few turns later to avoid a collision. No penalty given to Hamilton. 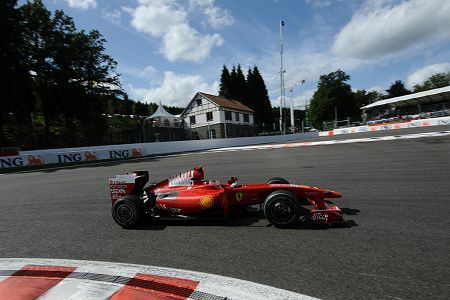 Kimi then used the run off quite deliberately in 2008, he entered the corner third, and returned third. (He also used run off on other corners to great effect during the duel with Hamilton in the wet towards the end of the race). No penalty given to Kimi although Hamilton was later penalised for cutting a chicane. I agree with you, now that Kimi has taken the same line again in 2009, gained a huge advantage by doing so, and remained unpenalised, it would be neglectful of any driver not to consider the run off as part of the race track in future. Kimi should clearly have been penalised, and should not have won the race. I was shouting this at the TV during the race, and had my girlfriend telling me off because no-one on TV mentioned that Kimi should have a penalty. The closest we got was in post race interviews when someone alluded to his "creative" line. I still think Fisi will drive a Ferrari at Monza. They may have poured cold water on it right now, but it doesn't mean they would say no if Ferrari approached them (which hadn't happened at the time of denial). I just don't see Fisi saying no - and FI would be reckless to say no out of pride (considering their current debts to Ferrari). Patrick: It is an interesting thought. Fizzy has always said he would drop everything if the call came from Ferrari but, if it were me and I were in the twilight of my career, I think I'd stick with Force India. There is no way he'd beat Raikkonen in an unfamiliar car, as you say, but consider the lasting glory of being the first to win for an Indian team. Like you, however, I hope he gets the offer and takes it - Liuzzi deserves a chance to show his skills again. SlicksF1: I remember well the Alonso/Hamilton incident you refer to. At the time, there was some discussion as to the legality of Alonso forcing his team mate off like that but general consensus was that it was "hard but fair". Later incidents in other races where Hamilton did similar things were condemned by many, however, and sometimes they were penalised, sometimes not. The inconsistency of the stewards has left the matter wide open and I maintain that it is necessary to go back to the rule as it is written. Otherwise we will have the ridiculous situation where drivers can use off track areas to gain an advantage. Then extension of the run-off area becomes necessary for safety reasons as such actions become commonplace - and the run-off areas will eventually become as large as supermarket car parks. I, too, was surprised that the TV commentators made no mention of the fact that Kimi's use of the run-off was illegal in terms of the regulations. Guys like Martin Brundle and Steve Matchett are usually quick to point out possible offences, perhaps to prepare us for the likelihood of penalties being imposed. I can only assume that they have accepted the fact that this is one rule that will always be creatively interpreted by the stewards, if they know it at all (and I would think they do, since it was used as the excuse to penalise Hamilton at Spa last year). Journeyer: Well, I guess we will know soon enough. I doubt very much that Ferrari will opt for Fizzy, however. He is under contract to Force India and there are plenty of other capable drivers available. Ferrari plucking Fisichella would be a very bad thing for the perception of fair play in F1. This would lead to headlines:'Force India finally succeeds, only to have Ferrari steal their top driver.' It would once again point to the arrogance and the impunity that Ferrari have, or believe they have, to be able to mess around with whoever they want, whenever they want. For me he gained unfair advantage! Why? Because while he was gaining momentum and speed into the off area, all the others guys (Trulli, Heildfeld, Kubica, Fisi all of them who done the right thing!) was fighting each other very, very hard in the corner and losing massive speed or even their nose or wing in this process. In Jenson´s on board camera you will notice that Kimi not even try to turn the corner into the track . He goes wide and get back straight into Kubica´s gear box. Nick: It would also be a very bad thing for Fisichella's career. Okay, he gets to realise his dream and has a few GPs for Ferrari (if he does well at Monza), but thereafter he is likely to find himself without a drive for next year. It could be a direct route to being replaced by Liuzzi. Becken: Reading your comment made me look again at my video of the race. In freeze frame mode it is quite apparent that Raikkonen makes no attempt at the hairpin. As Trulli turns in, Raikkonen on the outside of him keeps going straight, obviously intending to use the run-off area. Kimi was in fifth spot as he leaves the track but rejoins it in third thanks to the extra speed he was able to maintain through the run-off. If that isn't in clear contravention of the rules, I don't know what is. In fact, there were two other drivers that used the run-off area in similar fashion to Raikkonen: Button and Badoer. In Button's case, he was forced wide by Sutil getting sideways and making contact with Alonso - Jenson could see what was happening and kept well clear to avoid any cars flying outwards from the shunt. Until that point he had been turning in and there was no apparent intention to use the run-off from the outset. Badoer, however, gives the game away. He makes no attempt whatsoever to take the hairpin legitimately and just keeps going in spite of having no cars to avoid. I am forced to the conclusion that the rumour is true - Ferrari instructed both their drivers to use the run-off as a way to maintain momentum and so gain places. As it happened, neither Button nor Badoer gained anything by the manouever and so it could be adjudged legal (it being difficult to prove intent). But Raikkonen did. Interestingly, Kimi left the circuit at Les Combes too;all of his wheels were outside the white line through the second part of the chicane. He lost some momentum through the mistake but succeeded in keeping his place. Heidfeld and Barrichello also left the track at this point but actually lost places through doing so. All legit and above board therefore. Interestingly, Kimi left the circuit at Les Combes too;all of his wheels were outside the white line through the second part of the chicane. He lost some momentum through the mistake but succeeded in keeping his place. Well, if you slightly remember that Jenson were forced to give room to Webber because he cut a chicane at Valencia, I think Kimi, at least, should give room to Robert too. About Rubens case, the corner was a mess in that particular moment, and he would crash if he would turn it. I hate to disagree with you Clive, but I think Badoer did actually try to turn in. Both red cars were very fast starting, down the left of the track and with the KERS button probably giving them a healthy boost too. Part of me thinks they both just over-cooked it into the hairpin. Haha, that said, two Ferraris independently taking the same sneaky line is just toooo much of a coincidence isn't it?! Clive: But who else IS available? Gene? Too slow. Bianchi? Perhaps, but may be too raw to help Ferrari's quest for 3rd. Bourdais? He's gone to Superleague just today, so he's not available. Piquet? Sing-gate will make Ferrari even more averse to him (and that's not considering his Renault form). Kubica? May threaten any talks with Alonso. Fisi's the only guy available who's reliable in the short-term but not a long-term threat to anyone Ferrari may be talking to for a race seat. Journeyer: Good question. I agree that Fizzy would be the obvious option were all else equal. But Ferrari rarely do what we expect - remember how surprised we were when they opted for Schumacher as the replacement for Massa. Granted, some are saying that was just a publicity stunt but the choice of Badoer also came out of the blue. I think Ferrari could well pull yet another rabbit out of the hat. Yeah, that Kimi & Ferrari, what a bunch of cheaters huh? There's a difference, TB. Kimi gained from it, Button didn't. Nothing illegal about using run-off areas, just don't gain advantage from doing so. That's what the regulations say.